In this video you'll add short intros that will play at the start of your game and when the character arrives in each setting. These introductions will include text that describes the story's plot and helps the player understand what to do. To start click the Narrative sprite. This sprite will show at the start of the story, go to the front and introduce the player to the game's plot. Click the Costumes tab, and slide one. Click the text box on slide one. And write text that introduces your story. You might describe the setting and the problem the character has to solve, which is finding the missing object. Then click slide two and add more text to continue and develop the story. You might build on the problem introduced in the first slide or tell why the sprite needs to find this object. Or you might give clues about how to find the object. Then click the third slide and give the character the last bit of information that will send them off on their quest. Once you write text for all three, consider customizing the slides by changing the color or font of the words, or by changing the slide color with the colorize shape tool. Next program these slides to appear at the start of the game. Add a show block and a go to from block to make the slide appear in front of all the other elements on the screen. Click the block stack to test this. If the sprite isn't centered, either drag it to center it or click the Motion menu and add a go to xy block. Change the values to zero and zero. To make the sprite cycle between the three slides, add three switch costume blocks. Change the value in each to one of the slides. This code now reads, go to zero zero, show, go to front, switch costume in slide one, switch costume in slide two, and switch costume to slide three. Click the block stack to run it. It jumps right to the final slide, so you can't read the whole introduction. To fix this, add a wait block after each switch costume block. Tinker with the values in the wait blocks until they give the user enough time to read the text. Click the block stack to run this again. Finally program this code to run at the start of the program with a when flag clicked event and hide after it has shown using a hide block at the end of the stack. Awesome these introductory slides definitely will help develop the story behind this game. Next program the character sprite to talk about each location it enters. To do this click the character sprite. To run code when the sprite enters a new location, add a when backdrop switches block. For the first location select the house value. Then add a say block. What might this sprite say when it enters this new space? Remember that the sprite is looking for an object, so maybe this text explains why the object can't be in this location or shows that the sprite is scared, happy or frustrated. Add as many say blocks as you need to tell this part of your story. Use the arrow keys to make the sprite go to the house sprite. When the backdrop switches, great. The sprite says phrases that tell the story of this RPG and make the player feel like a part of the action. Add similar code for each location sprite. 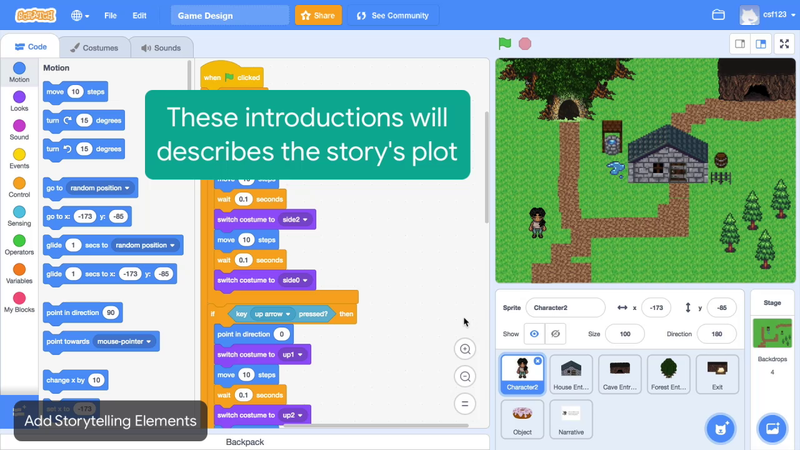 After you build out the story for your game, move on to the add-ons to further customize it. Add text to the narrative sprite's three costumes to introduce your story. Program the slides to show using when flag clicked, show, go to front, switch costume, wait and hide blocks. Finally make the character sprite say something using when backdrop switches and say blocks. Program the slides to show. Make the character sprite say something when the backdrop changes.